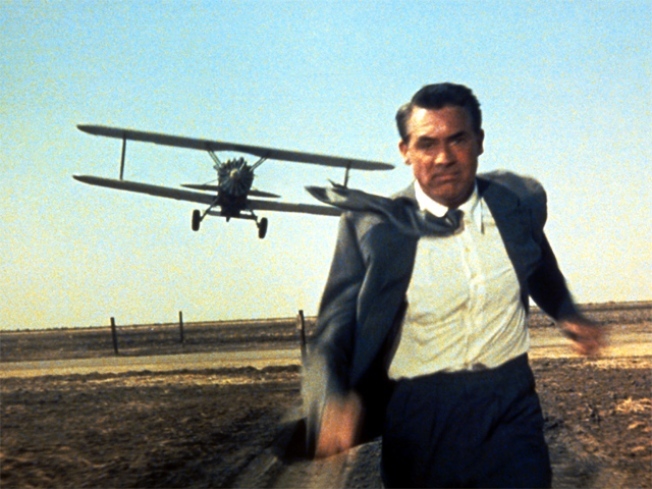 Cray Grant, sanguine as he outruns a cropduster in "North by Northwest". DE PLANE! DE PLANE! Alfred Hitchcock’s 50th Anniversary Special Edition DVD of North by Northwest is that rare thing: a reissue where the bonus materials actually make the film itself nearly secondary. Aside from presenting the movie in a gorgeously restored print and throwing in some making-of goodies and screenwriter commentary available in previous DVD releases, Warner Home Video gives you "North by Northwest: One for the Ages," in which the likes of Guillermo del Toro and Curtis Hanson discuss their love for the movie, and "The Master's Touch: Hitchcock's Signature Style," a doc where notables (like Martin Scorcese) deconstruct Hitchcock’s signature techniques and more. $23.99 at J&R, 23 Park Row, 212-238-9000. NATURE CALLS: Plenty of beauty products mine the touchy-feely parlance of ayurvedic healing, but they don’t all walk the walk. Anjolie All-Natural Fair Trade Ayurveda soaps are handmade in India with natural goodies – flowers, berries, herbs -- plucked from the foothills of the Himilayan Mountains as well as cold-pressed essential oils, plus they come wrapped in gorgeous gold-flecked handmade paper. The gift box of three makes a perfect indulge-yourself present. $33 at East West Living, 78 Fifth Avenue; 212-243-5994. INCREASING RETURNS: Scoop NYC – a chainlet where, frankly, we hardly need an incentive to spend more – is holding a Shop More, Save More event that goes a little something like this: If you spend between $250 and $499, you get 20% off, spend between $500 and $999 and get 30% off. And if you hit a grand, your saving hit a whopping 40%. Find locations here.